Thumbnails and Pinkies make the perfect gifts. Just like the full size prints they are signed, numbered and limited. 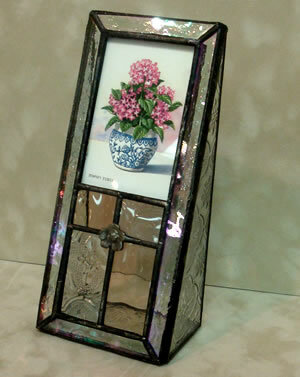 Framed, with easel, and gift boxed, they are perfect for coffee table, end table or night stand, You will enjoy seeing our most popular Essick gift line. Give one to someone you love and they’ll remember your forever. Give one to yourself and you’ll smile every time you look at it. Before the apples blooms drop, the hummingbird scouts have arrived and are at the window where the feeder is always placed. Some say there are no scouts, just early arrivals but nonetheless, the males who show up first seem to be there to locate a reliable food source. Dempsey’s rendering of a male hummer proudly reigning over his kingdom is showcased in a strikingly beautiful stained glass frame. And yes, you may search for the hidden hummingbird between the bottom petals of the prominent rose. The summertime experience is greatly enhanced when the adult butterflies are feeding. Active all day they, they flit over the landscape looking for the choice bloom and then are quite content to feed at the nectar. 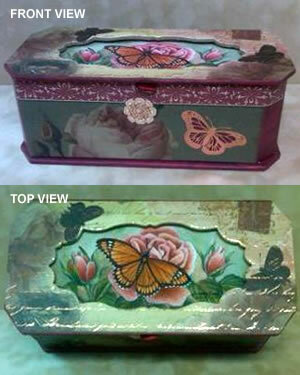 Enjoy your Monarch year round with Dempsey’s tiny music box featuring the image, “Choice Rose”. And yes, there is a hidden hummingbird in the image. 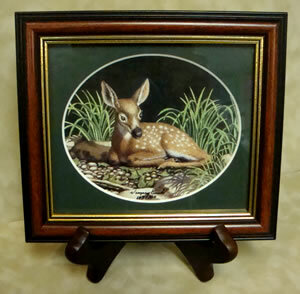 2013 • Open Edition • Framed size: 3" x 2"
A Touch of Glamour. 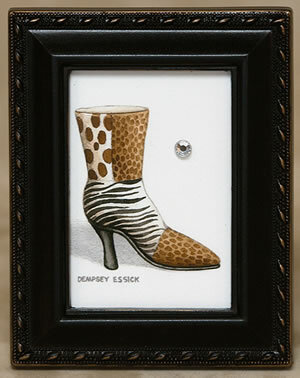 Perfect to sit on your desk or hang on your bathroom mirror is Dempsey’s pinkie painting of an animal print boot which will add a touch of glamour wherever it’s placed. Framed size: 3" x 2"
Does a mom know the difference in two outwardly identical offspring? Of course she does. And each will get their proper portion of any juicy tidbits Mom brings to the nest and each will grow up and raise their own little feathered bundles of joy. "Whose Turn Is It” is a sister piece to Dempsey Essick’s “Hummer a’ Nesting” which featured the mother hummingbird on the nest. In progression he has now captured the babies eagerly awaiting a little nectar or delectable insect. As always there is a hidden hummer and this time you will find it located in the nest. A largemouth bass explodes from the deep, giving a young angler a thrill that will be remembered for the rest of his life. 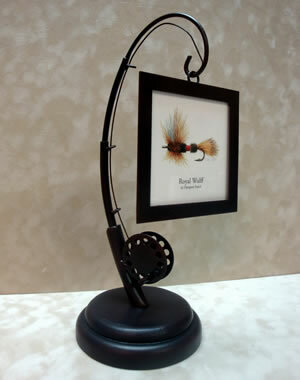 Even if the bass eludes the lure, the fisherman will be hooked on the memory for all his years to come. Uniquely housed in a 17 1/4 x 4 1/2" oar type frame, this piece groups well with our "B.A.S.S. Corner" mug. See in our online store. 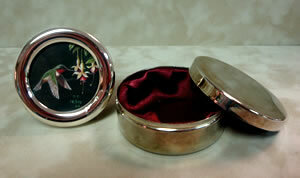 Valentine’s Day is approaching and you need an usual gift for your wife. So what does a feller do? 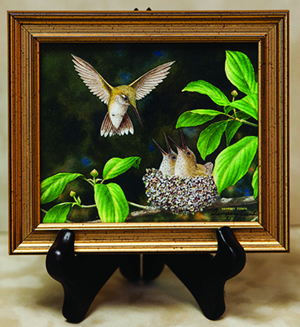 Well, if you’re Hummingbird Artist Dempsey Essick you paint something special- a male and female Ruby Throated hummingbird, kissing and forming the shape of a heart. 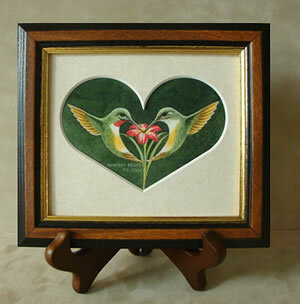 You take that small original and frame it with a heart shaped mat, title it “Lovey Dovey’ and you’ve got a winner. At Shelley’s encouragement, Dempsey is sharing his love offering with you, released as a thumbnail print. Perfect for a wedding or anniversary gift, this thumbnail is sure to please any lady on any occasion. It’s truly love-ly! 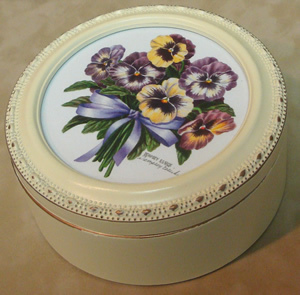 Every pansy lover needs Dempsey’s jewelry box! 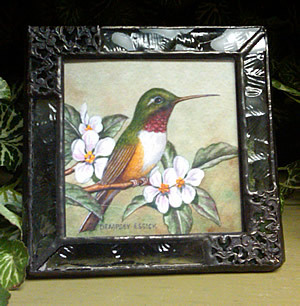 Appropriately mounted in a bejeweled frame, Dempsey Essick’s latest thumbnail painting is a rendering of a beautiful hummingbird that is sure to please the discerning collector. Caught in the act of sipping fresh nectar from a lovely cigar plant, the little hummer will be gone in the blink of an eye only to be replaced by another. And, if you have sharp eyes you may detect the outline of a hidden hummer lurking within the shadows. Inspiration comes in the strangest places and so it was with Dempsey Essick’s latest hummingbird painting. 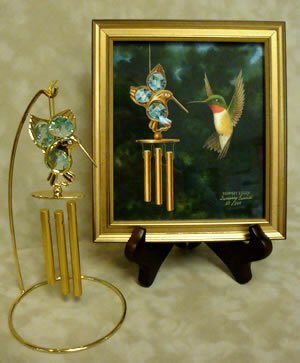 While in Atlanta shopping for new items for his Hummerville Gift Line, Dempsey spotted a small wind chime with a faceted aquamarine stone. “Face to Face” is whimsical in nature and destined to be a favorite with Essick Art Lovers. While supply lasts, the complimenting gift item is included with the framed print. This hidden hummingbird is tiny and can be found on the right hand side of the lower faceted stone beside the gold bracket. Any nature lover would be thrilled to see their hummer sipping nectar from the fushia plant hanging outside their kitchen window and that is the impression that Dempsey Essick gives you in this pinkie print entitled “The Window Box”. The small limited edition print is housed in a double image music box that gives the appearance of looking through a window. So precious! Sometimes Mother Nature’s creatures decide to lighten our day. 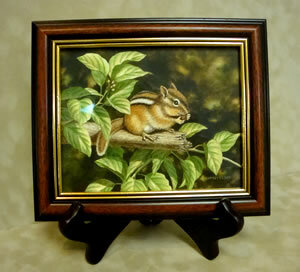 On a recent mountain picnic along the beautiful Blue Ridge Parkway, a spunky chipmunk joined the artist, Dempsey Essick and his wife Shelley. The curious little critter would come out on a nearby bare limb and eat his acorn then scamper away for another. This went on for the entire outing. Each time the little critter would come back to the same spot as if he were the host and the Essick’s were honored guests. And, indeed, they were. Joining tourists for a picnic is probably something the chipmunk does on a daily basis. It made for an unforgettable “Parkway Picnic” for the Essick’s and now it is an unforgettable image on Dempsey’s small painting. Contain your search for the hidden hummingbird in the leaves behind the chipmunk. Dempsey Essick has painted, as only he can, a lovely portrait of a dragonfly resting on a water lily. The pleasure for the viewer is having unlimited time to study the unusual flyer and to appreciate the delicate coloration and gossamer wings of the streamlined body. The painting is so realistic a viewer would not be surprised if the swift flyer suddenly levitated and zipped off in a blur of speed. Dempsey’s painting of flowers is unmatched. The delicate graduations of color of the waterlily are so real that you might wonder if an unseen rainbow trout lurks just beneath the surface. You will find the hidden shape of a hummingbird in the center of the yellow stamens. 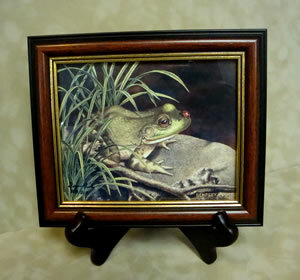 Dempsey Essick’s second painting in his Critter Collection is reminiscent of every 'Bullfrog Sitting on a Lilypad' song you ever heard. The frog in this instance is actually sitting on a rock but you can see from the gleam in his eye that he is about to enjoy his lunch. In his usual inimitable style, Dempsey takes the viewer on a whimsical ride right down to the edge of the stream where you can hear the flow of the water and see the frog smile. The ladybug is not yet aware that her selection of a landing pad was a huge mistake. There is no 'Broad Stroke' artwork here. 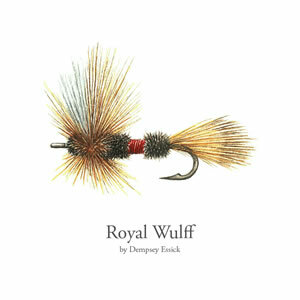 In this small masterpiece Dempsey demonstrates his specialty which is a meticulous attention to detail and an unmatched skill with the small brush. His depictions focus the viewers' attention to the small beauties that surround us and sometimes go unnoticed. Some of life’s simplest, everyday acts can be memorable. A cup of coffee in the morning is so commonplace it passes right out of your mind. But, if you sit down with a special friend in the afternoon or evening and that special friend serves up an aromatic cup of freshly brewed coffee, in a Blue Willow cup and saucer, and that cup and saucer sits on a pristine, freshly ironed doily, you will likely remember that cup of coffee. Perhaps you’ll have cause to remember it forever. The Blue Willow Pattern is the same as that used in one of Dempsey Essick’s favorite television shows, “Little House on the Prairie.” This particular cup and saucer is from the collection of Jean Hildreth. 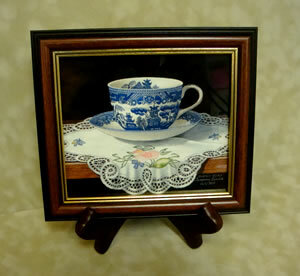 "Coffee Break" is a sister piece to the sold out thumbnail "Tea Time" which featured the Blue Willow tea pot. 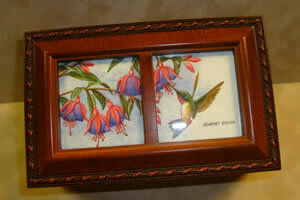 The hidden hummingbird is located in the blue embroidery on the left side of the print. Perhaps once in your lifetime, if you are very lucky, you might stumble across a scene like this one. You are hiking along a quiet woodland trail or, perhaps soundlessly wading in a stream, and there before you is a fawn, just awakening. You only glimpse it for a second before it disappears into the safety of the trees. But the image is burned into your memory forever. You never forget that magic moment. When Dempsey Essick was scouting the location for his painting “Wilson Creek”, in the Blue Ridge Mountains of North Carolina, he encountered memorable moments every day. He can remember the distant sound of a woodpecker knocking on a tree trunk; the splash of a mountain trout catching an insect; the percolating sound of water as it hurries over stones that were smoothed from being washed for centuries. He came away convinced that this was not the only fawn, over the years, to find this spot of sunshine by an ancient stream and someday he might return and see this fawn’s offspring in the same spot. Your coffee might come from Brazil or Hawaii. Your tea might be green, black, oolong, or jasmine and likely came from the Orient, but your sugar probably came from the southern United States. In a cafe or restaurant the sugar will likely be served in a smail paper envelope or a large dispenser with a small hole in the top. At home it is so much nicer to set out an elegant sugar bowl in a pattern matching the cups and creamer. If it happens to be the afternoon of an especially busy day you can find a measure of peace and tranquillity with your very own china, perhaps handed down from your mother and grandmother who also needed a bit of peace and tranquillity now and then. 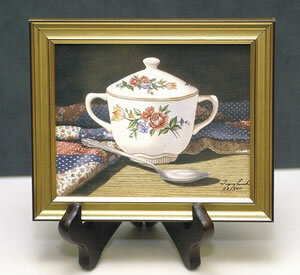 Dempsey Essick's small painting portrays a sugar bowl found in a Statesville, N.C. antique mall by Nancy Lewallen. 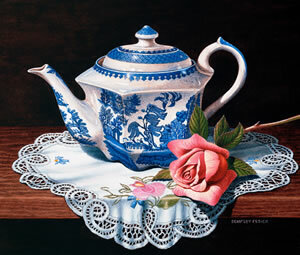 It was Nancy who also furnished the matching creamer in Dempsey's thumbnail print named "Serenity". 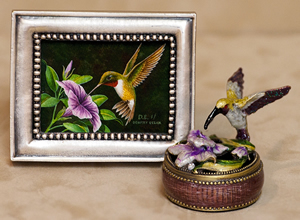 As is Dempsey's habit, he has included a hidden hummingbird image in the painting. This one is located to the left of the left handle of the creamer. 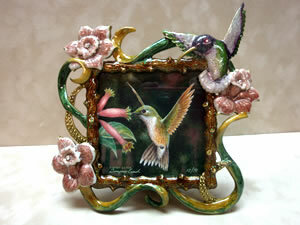 Hummer takes his choice of three fuchsia blooms in this pinkie print appropriately titled “Choice of Three.” The tiny art print is housed in a round silver frame and comes with the matching trinket box. 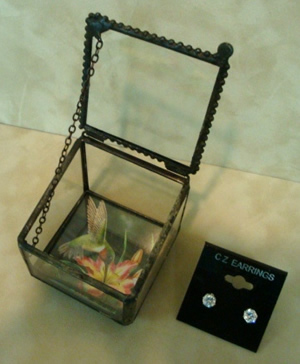 New to our gift line is our "Pinkie Edition," a tiny treasure, slightly smaller than our "Thumbnail Print." Pinkies are as elegant as the smallest of birds, the hummer. 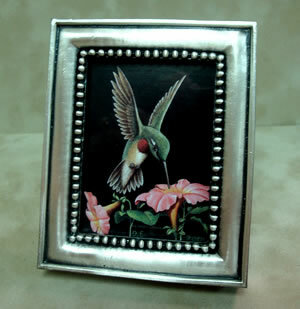 This attractive 7 oz pewter frame holds a fine art reproduction of a ruby-throated hummingbird sipping nectar from a petunia blossom and is titled "Sweet Petunia." Initialed on the front and signed and numbered on the back by the artist, this Pinkie Edition is a future heirloom. Cream for your coffee might be dispensed in several ways. It might be poured directly from a waxed cardboard container or shaken in powder form from a small paper envelope. In days past, restaurants provided thick cream in small glass containers. China creamers suggest a degree of civility associated with a quiet afternoon on the veranda with good friends. Enjoying the click and tinkle of real china cups and saucers and the subdued, mind-healing conversation far removed from a sometimes-chaotic world. The creamer so skillfully portrayed in "Serenity" was found in a Statesville antique mall by friend/customer Nancy Lewallen who recognized the pattern as the same as the cup and saucer in the Thumbnail Print "Peace and Quiet". 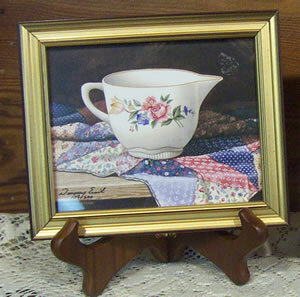 The creamer is displayed resting on the same Roxie Wofford quilt square used in the other print. The most commonplace miracles of nature, butterflies, are winged flowers that compliment the very air we breathe. A butterfly starts life as a heavy bodied caterpillar which, after ingesting a sizeable number of leaves, wraps itself in a silken cocoon and emerges a few weeks later as a feather light, wisp of color, seemingly carried on the breeze from flower to flower. Unlike the other insects, we never shoo a butterfly away. Instead, if a butterfly chooses to alight on one's arm or shoulder, we are flattered to be chosen and hold still lest we cause the winged flower to flyaway. 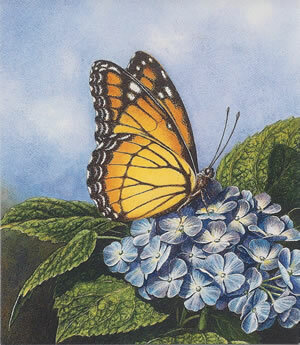 Dempsey has captured a Viceroy butterfly perched on a cluster of hydrangea blossoms. The Viceroy, with subtle differences, looks a great deal like the ubiquitous Monarch and it is a challenge to learn the markings of each. In either case, butterflies, like Dempsey Essick paintings, delight the eye while adding color and beauty to our world. When Donna Nixon provided a very nice porcelain demitasse (Fr. Demihalf; tasse-cup) cup and saucer for Dempsey Essick to use in one of his miniature prints, a discussion ensued as to the appropriate accessory to compliment the cup and saucer as well as enhance the picture. 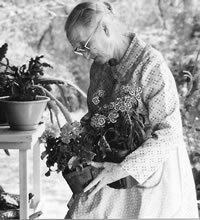 Donna told Dempsey's wife, Shelley, about a lady in Surry County name Ora Ellen Norman who made hand knitted lace. They borrowed one of Ora Ellen's doilies for the perfect accessory to the demitasse set. Ora Ellen Norman is a self taught lace maker. When she was a small girl, she learned to knit using two broom straws. An uncle gave her a set of real knitting needles in exchange for a pair of hand knitted socks. For her wedding, Ora Ellen's aunt knitted lace for the hem of her petticoat and Ora Ellen used that hem as a pattern, learning each knot until she could make her own lace. She uses needles as fine as wire to make delicate designs that are intricate and light to the touch. Dempsey Essick's rendering of the cup and saucer conveys the thin hardness of fine porcelain contrasted by the soft folds of Ora Ellen's lace. The scene captures the spirit of an after-dinner demitasse of coffee in the company of good friends. Blue is the color of fidelity. Blue ribbons are always the top award. Our good and reliable friends are always described as "True Blue." We live out our lives under the infinite dome of the blue heavens. Perhaps our affinity for the color blue explains the special place the Eastern Bluebird occupies in the minds of bird lovers. A few years ago, when the Eastern Bluebird was listed an endangered, thousands of people put up bluebird houses on the edges of fields all over the country. People, who had never lifted a finger toward conserving anything, joined the ardent, conservationists in a determined effort to save the beautiful blue songbird. And save it they did. No longer endangered, bluebirds have their choice each year of more new houses and live worm feeding stations. And when a new family of bluebirds hatch out in the house that you put up, who can blame you if you brag a bit. 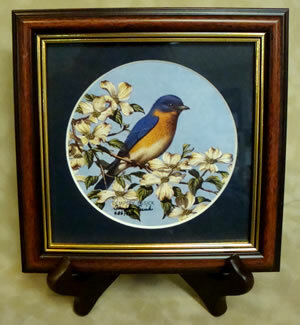 Dempsey Essick, a conservationist and bird lover, has painted a male Eastern Bluebird sitting on the limb of a wild dogwood tree. The newly opened blossoms tell us that it is early spring when the drift of white blossoms through the woods is the harbinger warm days and cool nights. The blue over tan coloration of the resting bird validates everyone who ever wore a blue blazer with tan slacks. Three days before her 17th birthday, Beth Essick received a rare and unexpected gift. She found a ruby-throated hummingbird on the back patio of her family's home. She picked up the apparently uninjured miniature creature and petted it for about five minutes during which time it made no effort to escape. In fact, it seemed to nuzzle up to Beth's finger when she would stroke its neck. 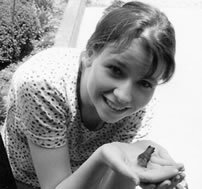 When the tiny bird finally took wing, it circled Beth's head several times before it flew away. It was a magical moment, one that turned an ordinary summer day into one that will be remembered for a lifetime. Beth's dad, Dempsey Essick, had been searching for a suitable subject for a miniature print to offer customers at his art gallery. 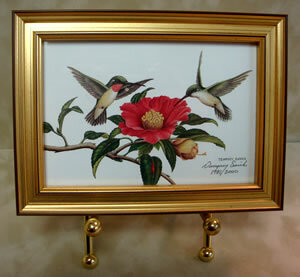 Beth's encounter was like a heaven sent sign and he painted "Camellia and Friends" to commemorate the event. The painting, "Camellia and Friends," has been featured as a signed featured as a signed and number thumbnail print, a checkbook cover, a mini pillow, a magnet and a mug. 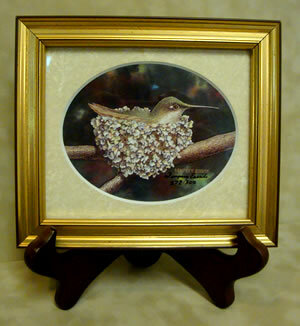 Mounted in a 2 ½ “ x 4 ¾” Bird Shaped Frame.